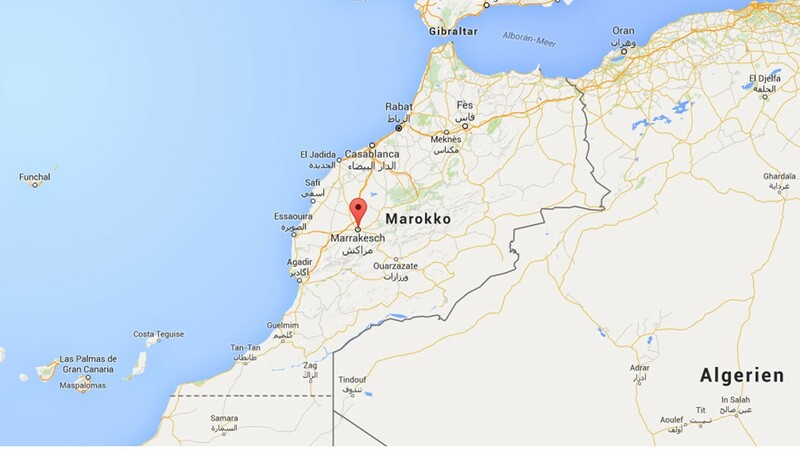 With about 940,000 inhabitants, Marrakech is the fourth largest city of Morocco after Casablanca, Fes and Tangier. 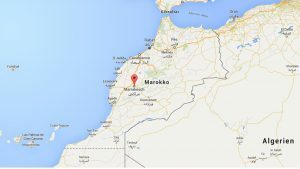 It is the capital city of the mid-southwestern region of Marrakesh-Asfi. Situated to the north of the foothills of the snow-capped Atlas Mountains, Marrakech is located about 240 km south of Casablanca. It is possibly the most important of Morocco’s four former imperial cities (cities that were built by Moroccan Berber empires). The region has been inhabited by Berber farmers since Neolithic times, but the actual city was founded in 1062 by Abu Bakr ibn Umar, chieftain and cousin of Almoravid king Yusuf ibn Tashfin. In the 12th century, the Almoravids built many madrasas (Koranic schools) and mosques in Marrakech that bear Andalusian influences. The red walls of the city, built by Ali ibn Yusuf in 1122–1123, and various buildings constructed in red sandstone during this period, have given the city the nickname of the “Red City” or “Ochre City”. 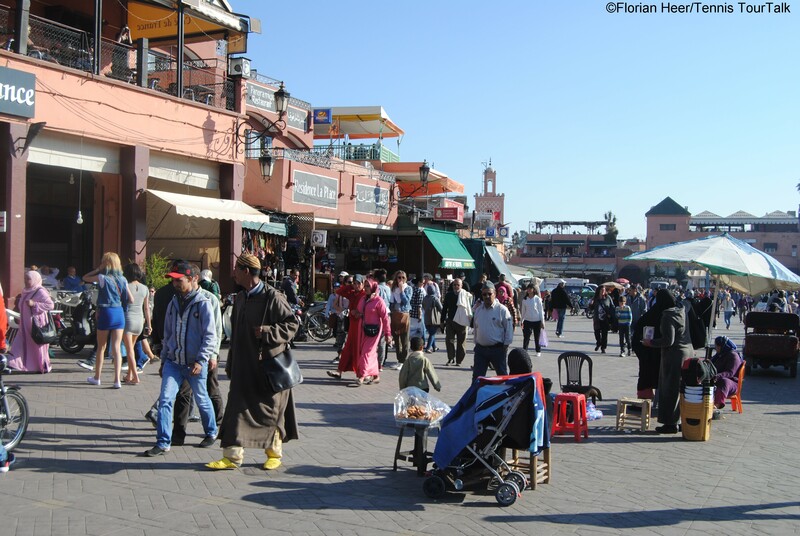 Marrakech grew rapidly and established itself as a cultural, religious, and trading centre for the Maghreb and sub-Saharan Africa. Like many Moroccan cities, Marrakech comprises an old fortified city packed with vendors and their stalls (the medina), bordered by modern neighborhoods, the most prominent of which is Gueliz. Here you can find tradtional Moroccan houses or palaces with an interior garden or courtyards, called riads. Some of them can be used for accommodation. 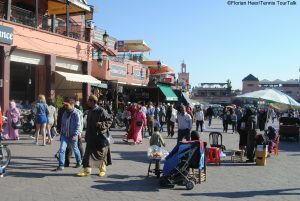 Marrakech has become one of the busiest cities in Africa and serves as a major economic centre and tourist destination. Tourism is strongly advocated by the reigning Moroccan monarch, Mohammed VI, with the goal of doubling the number of tourists visiting Morocco to 20 million by 2020. Marrakech is particularly popular with the French, and numerous French celebrities own property in the city. Marrakech has the largest traditional Berber market (souk) in Morocco, with some 18 souks selling wares ranging from traditional Berber carpets to modern consumer electronics. Crafts employ a significant percentage of the population, who primarily sell their products to tourists. The Jemaa el-Fnaa is one of the best-known squares in Africa and is the centre of city activity and trade. It has been described as a “world-famous square”, “a metaphorical urban icon, a bridge between the past and the present, the place where (spectacularized) Moroccan tradition encounters modernity.”It has been part of the UNESCO World Heritage site since 1985. One of the name explanations is “assembly of the dead”, referring to public executions on the plaza around 1050 AD. During the day it is predominantly occupied by orange juice stalls, water sellers with traditional leather water-bags and brass cups, youths with chained Barbary apes and snake charmers. Koutoubia Mosque is the largest mosque in the city, located in the southwest medina quarter of Marrakesh alongside the square. It was completed under the reign of the Almohad Caliph Yaqub al-Mansur (1184–1199), and has inspired other buildings such as the Giralda of Seville and the Hassan Tower of Rabat. The mosque is made of red stone and brick and measures 80 metres long and 60 metres wide. The minaret was designed to prevent a person at the top of the tower from viewing activity within the king’s harems. The Umayyad-style minaret is constructed from sandstone and stands 77 metres high. It was originally covered with Marrakshi pink plaster, but in the 1990s experts opted to remove the plaster to expose the original stone work. The spire atop the minaret is decorated with gilded copper balls that decrease in size towards the top, a style unique to Morocco. 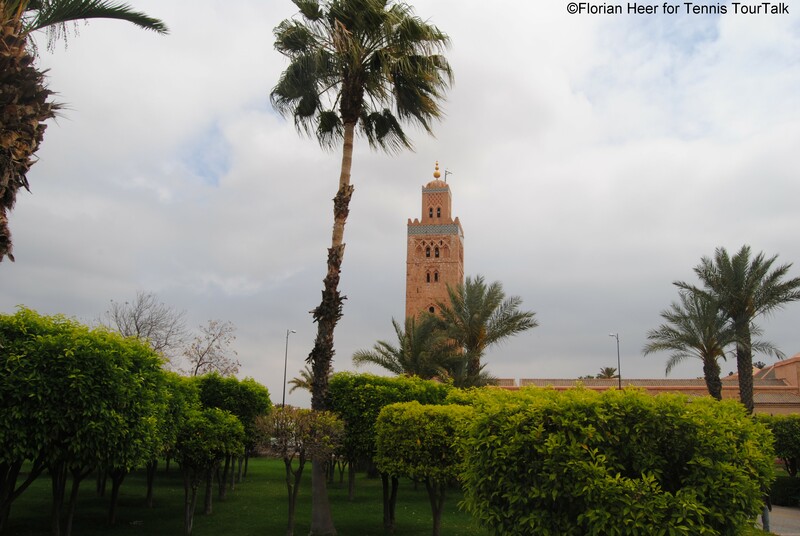 The Menara gardens are gardens located to the west of Marrakech at the gates of the Atlas mountains. They were established in the 12th century by the Almohad ruler Abd al-Mu’min. The name menara derives from the pavillon with its small green pyramid roof (menzeh). The pavilion was built during the 16th century Saadi dynasty and renovated in 1869 by sultan Abderrahmane of Morocco, who used to stay here in summertime. The pavilion and basin (an artificial lake) are surrounded by orchards and olive groves. The intention of the basin was to irrigate the surrounding gardens and orchards using a sophisticated system of underground channels called a qanat. The basin is supplied with water thanks to an old hydraulic system which conveys water from the mountains located approximately 30 km away from Marrakech. The Saadian Tombs were built in the 16th century as a mausoleum to bury numerous Saadian rulers and entertainers. It was lost for many years until the French rediscovered it in 1917 using aerial photographs. The mausoleum comprises the corpses of about sixty members of the Saadi Dynasty that originated in the valley of the Draa River. The Grand Prix Hassan II, inaugurated in 1984 and entirely funded by Morocco’s King Mohammed VI. is the only stop of the ATP World Tour on African soil. The annual tournament has been moved from Casablanca to Marrakech in 2016 and is part of the 250 series. It is held at the Royal Morrocan Tennis Club. In 1984, Morocco organized its first ATP event in Marrakech with a prize money of $50,000 attracting some of the best players and young talents of that era. The success of the tournament encouraged the organizers to be optimistic about the future. 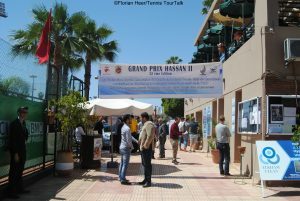 In 1989, the tournament moved to the Complexe Al Amal in Casablanca to give the event a more international dimension and one year later it became part of the ATP Tour. With several increases in prize money and more ATP ranking points, the tournament attracted the big names of international tennis like those of former world number ones Thomas Muster, winner in 1990 and Juan-Carlos Ferrero, champion in 2009 as well as Stan Wawrinka lifting the trophy in 2010. 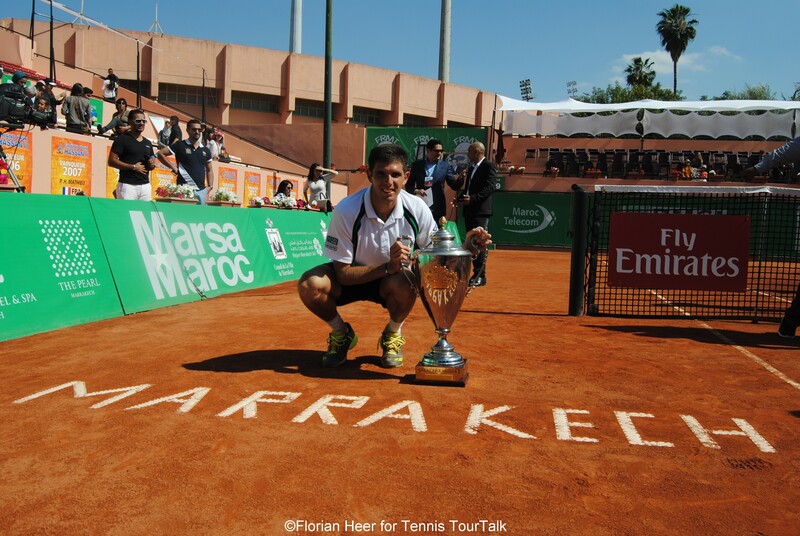 Two Moroccans have captured the title in their home country: Hicham Arazi in 1997 and Younes El Aynaoui in 2002. 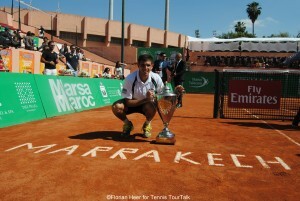 After the tournament’s relocation to Marrakech in 2016, its first champion became Federico Delonis.